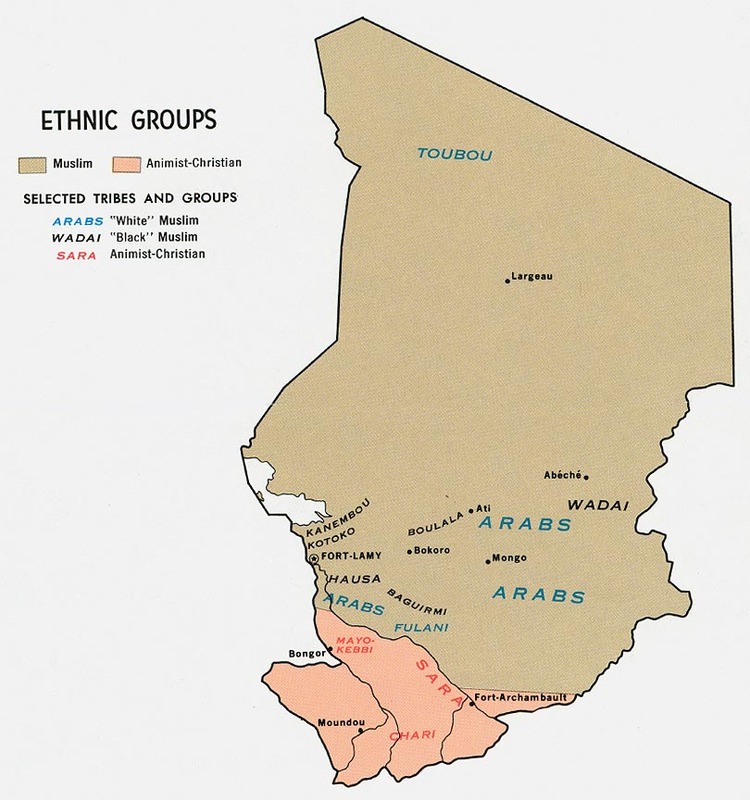 The Arabs of Chad occupy northern Cameroon and Nigeria (where they are sometimes known as Shuwa), and extend as a belt across Chad and into Sudan, where they are called the Baggara. The Chadian Arabs live in the dry central Chadic Sahel zone of the landlocked country of Chad. Libya surrounds the country to the north; while Sudan is to the east; Niger is to the west; and Nigeria, Cameroon, and the Central African Republic are to the south and southwest. Because of its central location, Lake Chad is the region's most important body of water. Arab ancestors emigrated from Sudan to Chad during the fourteenth century. They were primarily nomadic camel herders and slave traders. By the eighteenth century, the Arabs counted their wealth in their large herds of horses, cattle, goats, and sheep. Although the Arabs are respected by the Chad government because of their wealth in animals, they don't play a very large role in Chad's political arena. Their pastoral lifestyle has also saved them from being forced by the government to change culturally-an action that has disrupted the lives of the more settled peoples. Chadian Arab towns are composed of small compounds grouped according to male family and tribal lines. The shaykh, or male elder, usually has his house in the center of the camp or settlement. His house is closely surrounded by the houses of his family and relatives. The Arabs generally have two homes-one in the village and one in a nomadic camp. During the dry season they live among more sedentary groups and share their agricultural lands. When the rains come the Arabs spread out among other Arab groups that live in the region. Marriage is used to strengthen kinship ties and is more a family than an individual concern. Arab men frequently have more than one wife. One wife usually lives in the nomadic camp, while the other lives in the village. The roles of Arab men and women are strictly separated. Women are responsible for almost all tasks concerning home and family, including the construction of adobe houses, woven straw tents, the cooking areas, or any other structures associated with the house. They are the children's primary caretakers. Women also milk the cows that provide the family with dairy products. They earn extra income (which they keep) by selling the milk, butter, cheese and other products. Men manage the cattle and the crops of millet, yams, plantains, and cassava melons. They also build sun shelters, which they use for eating and entertaining while they are tending the herds. Young boys herd calves and small livestock. Most children attend a Koranic school, although girls usually withdraw after about six years. Chadian Arabs are predominantly Sunni Muslims, but they are not particularly interested in Muslim fundamentalist ideals. They observe the five pillars of faith (declare the faith of Islam, say daily prayers, give alms, fast, and make the pilgrimage to Mecca). Almost any occasion - the arrival of a visitor, unexpected good fortune, or someone returning from a trip - is an excuse for a communal feast. Betrothal, marriage, and moving newlyweds to their new residence calls for a major celebration, because it is considered a life-stage transition. This celebration also offers young people an opportunity for courting. Even the death of a family member is followed by feasting after a mourning period. Three religions co-exist in Chad: classical African religions, Islam, and Christianity. However, there is a great divide in Chad between the northern peoples (Muslims) and the southern peoples (Christian/Animist). Although they share the same political boundaries they are worlds apart in their cultures. Due to a history of tensions between them it is very difficult for a southerner to evangelize a northerner. Muslims make up the majority of Chad's population, including the Arabs. Many missionaries have left because of the numerous conflicts, political upheavals and harsh living conditions the country has suffered over the past twenty-five years. * Scripture Prayers for the Baggara, Shuwa Arab in Chad. * Ask God to grant wisdom and favor to missions agencies that are focusing on the Chadian Arabs. * Pray for effectiveness of the translated films and radio programs among the Arabs. * Ask God to anoint the Gospel as it goes forth via radio to not only the Arabs but many of the Muslim groups that understand Chadian Arabic. * Ask the Holy Spirit to soften the hearts of the Arabs towards the Gospel. * Ask the Lord to strengthen a small emerging church and to bring forth a holy Arab church spreading to neighboring tribes and beyond for the glory of His name!